Autumn is the time when color explodes across the different regions of China. While most travelers get their backpacks ready in pursuit of the golden brown leaves of the west, some set their eyes on a stretch of maddening red wetland in Panjin, northeast China's Liaoning province. 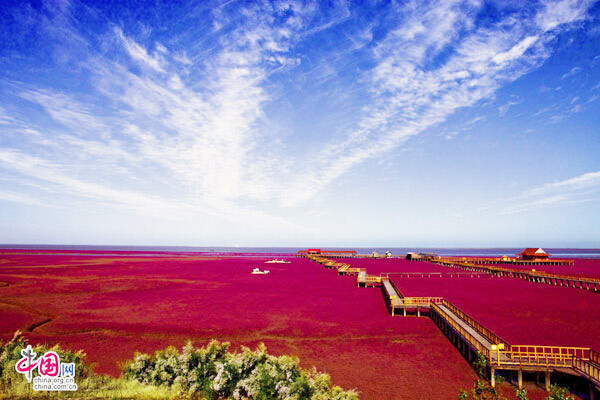 Every year, from September to October, the immense coverage of seepweed in Yueyawan Wetland Park in Panjin changes color, from luscious green to flaming red to deep purple. A wooden bridge has been constructed, which meanders its way into the heart of the thick red carpet of seepweed, allowing visitors to walk across the scenery and take a closer look for themselves. Boats are also available for a slow sail across this temporary sea of red. Besides the vast expanse of red wetland, the park is also the temporary home for numerous migratory birds, including a number of rare species such as the red-crowned crane. The park draws large numbers of bird watchers in March and October every year as flocks of birds arrive and leave the habitat in search of warmer climates. As the number of tourists has gradually increased, the park administration has also added various entertainment facilities to enhance their stay. For instance, the park has a small museum exhibiting the wildlife and ecosystem of the wetland; a zoo housing different species of birds; an open space for horse riding; and a kart racing track for the kids. Despite being close to Shenyang, the capital of Liaoning province, the scenic area is conveniently connected to Beijing via highways and railways. Direct trains linking Beijing to Panjin take about seven hours, while the bullet train gets you there in less than half the time, taking a little less than three hours. Buses regularly depart from Panjin city, transporting tourists to the wetland park.